Richard Ward (Oxford) Ltd were established in 1850 by two brothers trading under the name Ward Bros. The company was first located in Eynsham, then after many years eventually relocated to Oxford to better service and grow its local client base. The business now trades from its Head Office in the picturesque village of Islip, a few miles outside Oxford. The company has remained in the Ward family from its origins to the present day, with the current managing directors/owners at the helm for the past 25 years. We continue to retain our strong ties with the city of Oxford, where the majority of our work is carried out, predominantly within the education sector, for individual Oxford Colleges and the Oxford University Estates Department. Producing a staircase in our in-house joinery workshop. 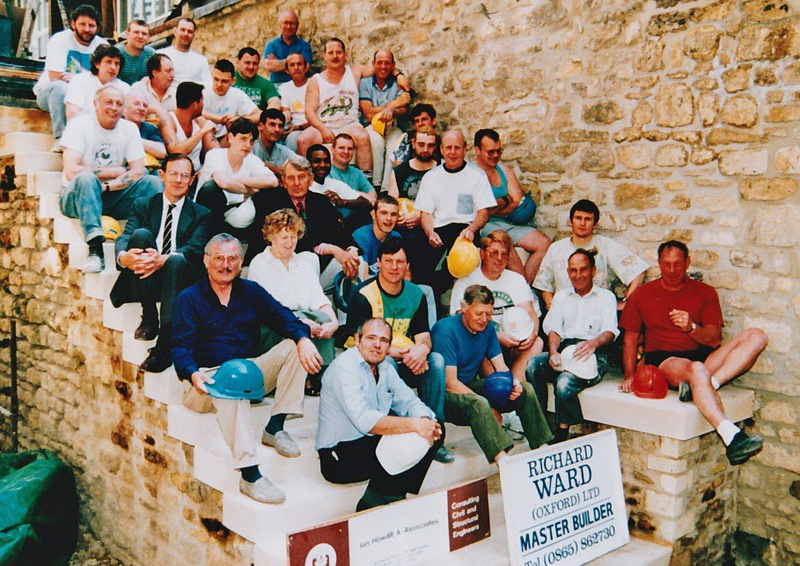 The Richard Ward team during the 1980s. 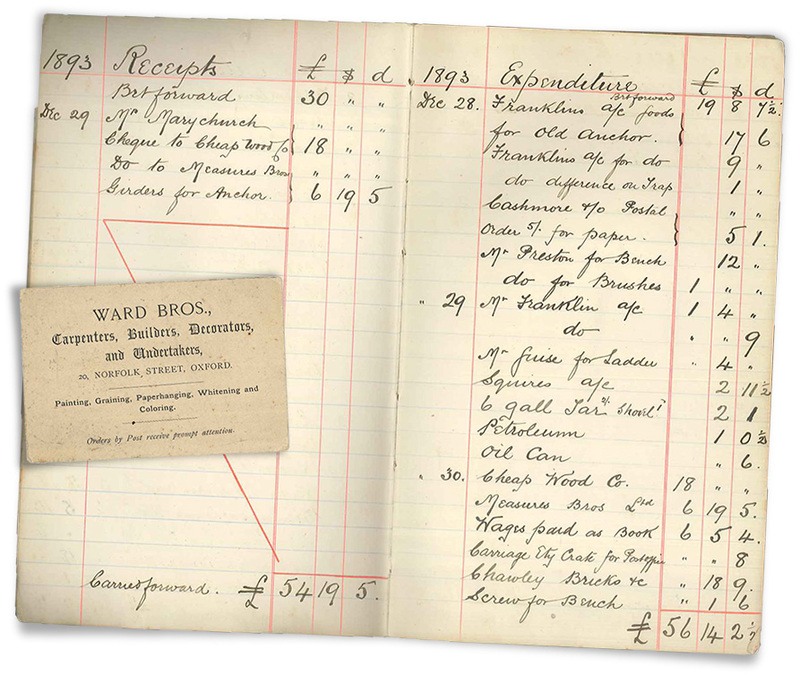 Harry Ward's 1893 cash book with one of our early business cards. Our projects are diverse in nature, consisting of, but not limited to the refurbishment of student accommodation facilities, extension & renovation of domestic dwellings within college property portfolios, and specialist refurbishments to listed buildings, including repair and maintenance of some of Oxford’s most historic and iconic buildings. For over 160 years, we have honed our skills and services to satisfy a wide range of expectations from clients, both professional and domestic, in order to provide high quality results and peerless customer service throughout all stages of the construction process. 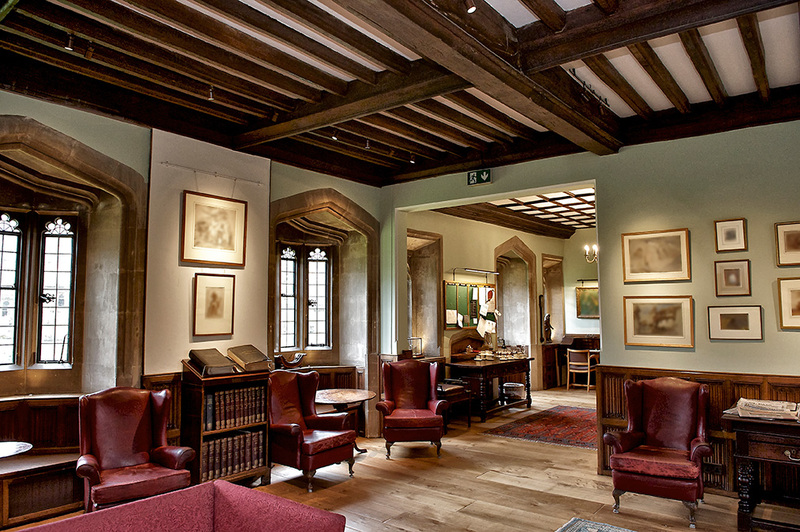 This customer care and attention to detail in our work is most obviously illustrated by our ongoing work with the University of Oxford, whose continued trust and confidence in our service and craftsmanship allow us to work in very sensitive environments, on some of the most prestigious buildings in Oxford. In addition to our larger projects, we carry out smaller repair and maintenance. These works range from reactive, unforeseen call-outs through fire precaution and upgrade works in department buildings to complete external repair and redecoration projects. Occasionally, we carry out high-end refurbishment projects for domestic and private clients. We evaluate each potential project individually to ensure we undertake schemes that chime with our company ethos and vision, and that challenge our skills so we can be sure to deliver high quality results to the client. 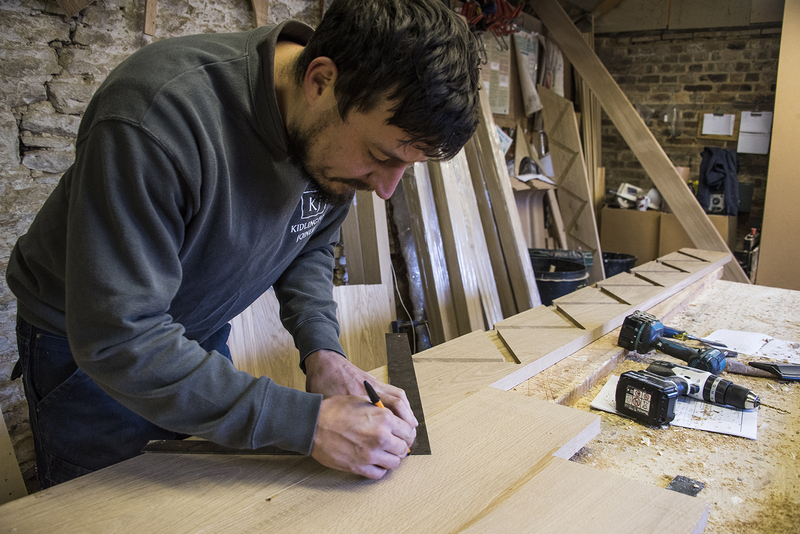 In addition to the construction side of the company, we have the benefit of our own in-house joinery division who are on hand at all times and have the skills and knowledge to manufacture virtually any bespoke item, such as staircases, sash windows, glazed screens and bookcases. All items are handmade to the highest of standards by our craftsmen. Irrespective of size, value or complexity, each project is appraised, managed and overseen by contracts managers & surveyors, hand selected to suit the project, together with a team of highly skilled direct and sub-contracted labour, to ensure the successful delivery of each and every project we undertake.